What do you know. A Big Three, and the Bulls may just have them. 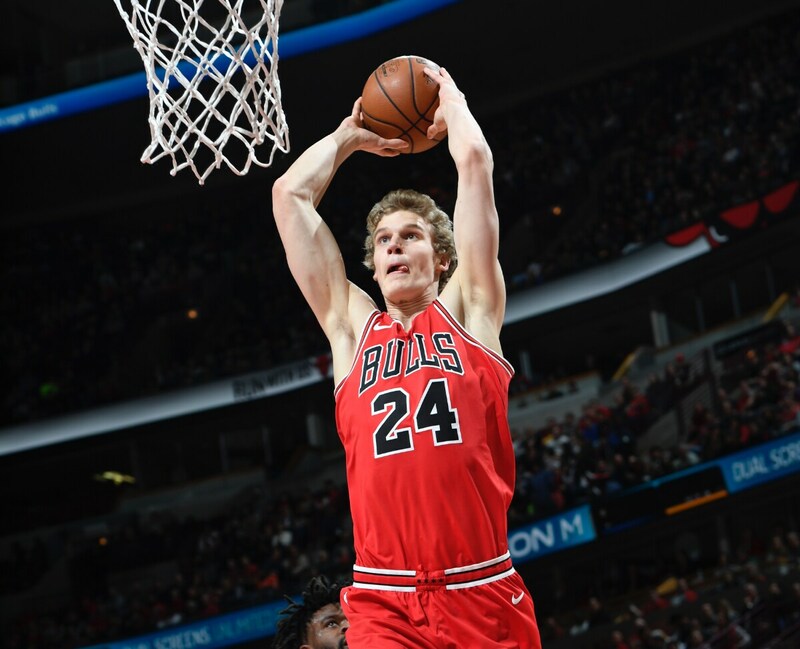 Lauri Markkanen with a team high 19 points, effectively, made the game winner in a 107-105 victory Saturday over the Detroit Pistons with a baseline 17 footer with 1:08 left. 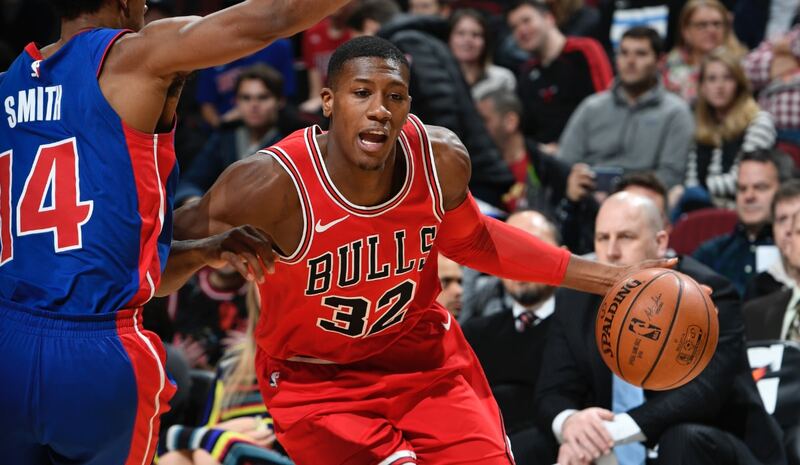 Kris Dunn with 18 points, eight rebounds, eight assists, three steals and three blocks made the Bulls previous two baskets, each giving the Bulls a lead after trailing. And then was credited with the blocked shot at the buzzer to prevent a Pistons fast break score that would have tied the game. All this in the Bulls debut of Zach LaVine, the third player from the Jimmy Butler trade, who in his return from February ACL surgery looked smooth, sure and superb with 14 points in 19 minutes. "I think we can be really good," said LaVine, who made three of four three pointers, including the first shot he attempted. "We can make a push and that's our job to do that. We can't control outside thoughts. We are ball players; we go out there, try to win. I think we're good. "Growing and winning close games is something we are going to have to continue to do," LaVine added. "Especially where we want to get (as) we start growing together and when we get to that point, where we need to be in the playoffs (and) going to be contending for things. Growing and getting better every game." Suddenly a season that was supposed to be about losses doesn't look so lost. Sure, the Bulls are just 16-27 with a second straight riveting finish victory. The Pistons fell to 22-19. But in a fast-paced, exhilarating game with 23 lead changes and seven ties, it was the baby Bulls who three times in the last three minutes made plays and shots to overcome a deficit. It was the Bulls with the second half defense after a wide open first half in which the Pistons led 61-60. 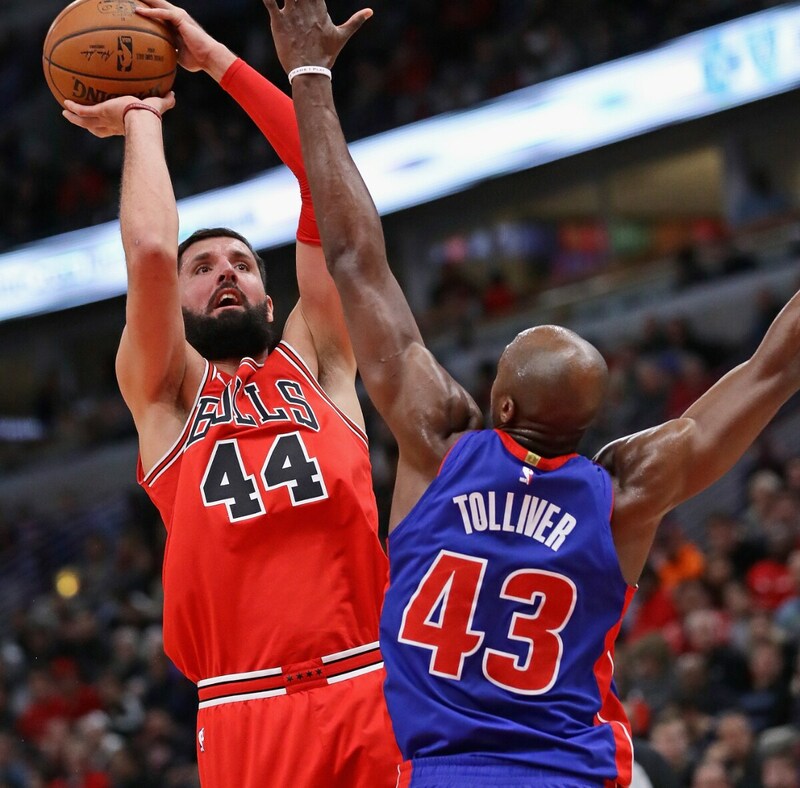 It was the Bulls reserves led by Nikola Mirotic and Bobby Portis, forever synonymous, it seems, who scored all the Bulls points in the first eight minutes of the fourth quarter to prevent the Pistons from stealing the game. It was LaVine with prescribed playing time for now sitting out the fourth quarter after, at least, symbolically assuming the franchise's future leadership as the last to be introduced pregame. There also were LaVine bobblehead figurines distributed to fans, who heartily welcomed the once and perhaps future star. "I feel like I still play the same way. I feel I got a little stronger fighting through the little aches and pains; it doesn't change the way I play. I'm still the same guy." "Chicago embraced me (with) love and support," acknowledged LaVine. "Really appreciate that and I'll continue to do everything I can for this city. I want to continue to get out in the community and let them know (me) as a Chicago Bull. You've got to prove your worth and that's what I'm going to continue to do." It was an impressive start for his season and return, but perhaps more the vision of a future starting to come into focus of the athletic backcourt and the seven foot clutch shooter surrounded by high level role players. Robin Lopez had 12 points, all in the first quarter, getting the Bulls off to a blazing 36-31 start that Bulls coach Fred Hoiberg said was the best first quarter of the season and blueprint for how he wants the Bulls to play. Mirotic making his return from a virus had 16 points in 21 minutes with four of nine threes. Portis had 15 points in 18 minutes with two of three on threes. "I think me and Bobby are having great chemistry," said Mirotic. "We've been learning to play with each other. When I am there we basically are playing together, so I think the team is having success with the two of us on the court. We are reading each other and he is shooting great from the three-point line." 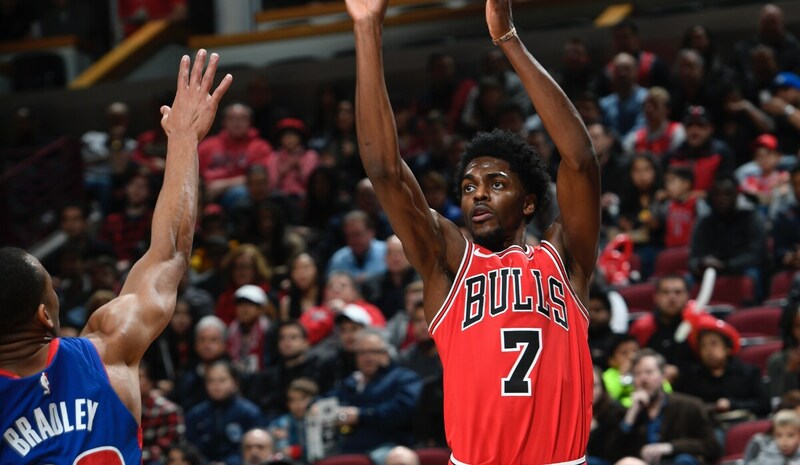 Justin Holiday added nine points with three of five three pointers. Denzel Valentine, who moved back to the bench, had just two points. But he had five rebounds and three assists and Jerian Grant added seven assists, 27 overall for the Bulls with 10 steals, 13 fast break points and 17 three pointers. Markkanen continued his all-time NBA rookie record of total three pointers. And essentially asking for the big shot with just over a minute left and the Bulls trailing 105-104 after Avery Bradley with 26 points made a 22 footer. Markkanen missed an open three on a pass out from Lopez. The call went for the Pistons out of bounds, but was overruled on replay. "Lauri, who obviously made huge plays all game long in New York," Hoiberg would relate, "missed that open three and he came to the sideline and so calmly said ‘That's my fault, guys. I got to make that.' We had a reversal of the call they were reviewing. So we drew up the play to get Lauri the shot. Robin set a great screen to get him open. He had no hesitation. He rose up and knocked it down. To be that calm as a 20-year-old rookie is such a great sign for him to rise up and knock down the game winner." It wasn't quite over, and big plays still were required from that young core. Andre Drummond with 21 points and 15 rebounds and eight offensive, curiously, faked a handoff and drove. Lopez cut him off. He missed and Dunn went high for the rebound, knocked off balance by Bradley and hard on his back. Dunn took some time to recover, but related he was fine afterward. Dunn made one of two free throws for a 107-105 lead with 38.5 seconds left. David Nwaba forced Bradley into a tough three pointer that missed and Dunn rebounded again. The Bulls wheeled the ball around to run down the clock. Holiday got it and tried to drive with about seven seconds left and lost the ball. The Pistons had a two-on-one break with Tobias Harris and Reggie Bullock and Dunn in the middle back peddling. Harris passed to Bullock coming down the left side. Dunn slid over in front of Bullock. Bullock's shot missed as Markkanen grabbed the rebound as time expired. Bullock said he was fouled and it's possible, though Harris was wide open for a lob that never came to tie the game. "Kris Dunn made a couple of big plays for us down the stretch," said Hoiberg. "The rebound was huge and got fouled and then when we did turn it over he sprinted back and got in the way. Did a good job going straight up to force the miss. Great defensive play by Detroit to get the steal and turnover; we were fortunate obviously the shot did not go down. "Kris got us off to a great start tonight," Hoiberg added. "His pace and energy defensively, he was getting deflections, got a stop on the break, did a great job continuing to throw the ball ahead to get the pace established. And the fourth quarter stepped up and hit some big shots. I thought again Kris played his best basketball down the stretch." It was a thrilling start, and not just for the LaVine debut, the first play getting him a three and LaVine making it. He played the first four minutes with the Bulls ahead 12-11 in a quarter they had 36 points after 10 minutes. "The first quarter I loved; we were absolutely flying up the floor and I loved the confidence those guys were stepping up and shooting the ball with," said Hoiberg. "We didn't guard great. The biggest thing for me was look at that second half: We challenged our team to get in somebody's way and guard somebody and we held them to 36 percent in the second half and 44 points, 21 in the fourth quarter. That's a step in the right direction for us because obviously we have been struggling on that end. That first quarter was as good as we've been." LaVine started the second quarter for a segment with the reserves as he made plays for Portis. LaVine even tried to lob dunk one, but Mirotic's pass was a little behind. "I told Niko to throw that more toward the rim and not behind me," said LaVine. "I still should have made it. I wanted to dunk that." No fear. LaVine added a hard drive for a 51-44 lead and Markkanen got a two-hand slam dunk on a nifty pass from Valentine, though Detroit led at halftime. The Bulls had it going on both ends in that third quarter to edge ahead 87-84. LaVine opened with another three, the proverbial knife through butter. "He's a very smooth player and has a lot of confidence," said Hoiberg. "To rise up in his first shot and knock down a three shows you that he's just been itching for this moment. I thought he played very effective and efficient. Made good plays when they stepped up and double teamed him to get the ball moving and hitting guys (with passes). He glides up the floor. He can handle it. He hit a couple threes off the bounce where he just kind of froze the defender. He's just a guy that plays the game easy." Dunn had a drive and power dunk for a 72-69 lead and then my favorite play of the game. Drummond ran to the right corner to save a long rebound. As Drummond caught the ball teetering out of bounds, you could see Markkanen anticipating where the pass would go. Markkanen stepped up, tipped the ball ahead to himself and then dribbled up the left side with Holiday on a two-on-one. Markkenen delivered a fundamental bounce pass to Holiday, who touch passed it back to Markkanen for a layin and three-point play. "I should have thrown the lob to Justin," Markkanen said with a smirk. "But I'm not used to playing with guards who can jump." There is a sense of humor in there. It's becoming more and more enjoyable for these Bulls who suddenly have a lot of impressive young talent. "Not really butterflies, but just anxious, happy to get out there playing again," said LaVine. "It's what I love to do, one of the best feelings to go out and playing in front of 20,000 people and get teammates support, medical staff, your family, a lot of people. So you want to go out and perform and do what you do again. An emotional roller coaster. I think it made me a better person, a better player. "I feel like I still play the same way," said LaVine. "I feel I got a little stronger fighting through the little aches and pains; it doesn't change the way I play. I'm still the same guy." Dunn, Markkanen, LaVine. Looking good.